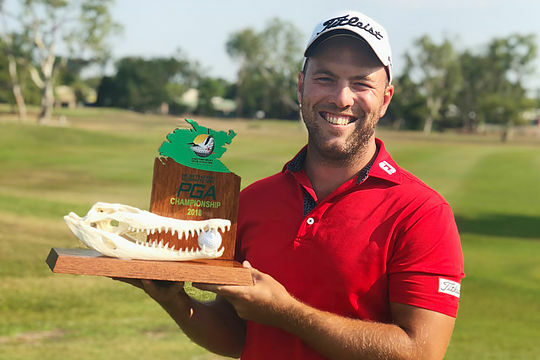 A dominant display of golf has seen Daniel Nisbet win the 2018 MMC Northern Territory PGA Championship at Palmerston Golf Course. Starting the day three shots off the lead, Nisbet knew he needed a low round to win his second title on the ISPS HANDA PGA Tour of Australasia in 2018. Firing 8-under 63 was enough to hand the Queenslander a two-shot win with a tournament total 19-under 265. “I am pretty excited, it has been a long few days out in this heat, so it’s relief, exhaustion, excitement,” said Nisbet who claimed a share of the lead after the 10th hole today. “I got off to a good start today like I have all week, but the back-9 really helped me today. I hit a couple close in there and holed some putts which were the difference from the last few days. Having won the ISPS HANDA New Zealand Open in March and earning full status on the Asian Tour, Nisbet travelled to the Top End looking to secure his lead on the ISPS HANDA PGA Tour of Australasia Order of Merit. He currently holds an almost AU$28,000 margin over Anthony Quayle with the pair eyeing the opportunities on offer from an Order of Merit victory. “This definitely helps the Order of Merit. In my situation I need to get as much money up as I can to prevent being run down at the end of the year,” added Nisbet. The ISPS HANDA PGA Tour of Australasia Order of Merit offers the winner a Major Championship start at The Open, the leading two players invites into the World Golf Championship – HSBC Champions and World Golf Championship – Mexico Championship and the leading top-10 players a start in the European Tour’s Alfred Dunhill Links Championship. In addition to a number of exemptions into international qualifying schools for the top-ranked players, the highest finisher on the ISPS HANDA PGA Tour of Australasia Order of Merit, not already exempt onto the European Tour, will receive a full card for the 2019 season. “I think this is the best the Tour has ever been for the young guys coming out. If we get to the top of the money list we can go to Web.com and European Tour Qualifying School, earn starts in the Dunhill Links, World Golf Championship tournaments and The Open,” added Nisbet. Finishing two shots behind the champion were 2018 Papua New Guniea Open champion Daniel Gale who fired 7-under 64 today and 2017 Victorian PGA champion Damien Jordan who fired 3-under 68 to finish with a tournament total 17-under 267. New Zealander Mark Brown finished outright fourth on 15-under the card while Adam Burdett and Maverick Antcliff rounded out the top-5 finishing on 14-under the card. The ISPS HANDA PGA Tour of Australasia will next be in action at RACV Cape Schanck for the Victorian PGA Championship from 11-14 October.